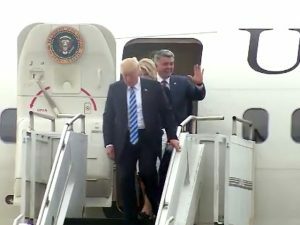 Colorado Sen. Cory Gardner is apparently undecided about whether he’ll back legislation protecting Special Council Robert Mueller. Gardner’s fellow Republican Sen. Jeff Flake of Arizona has said he’ll push such legislation before he leaves office at the beginning of next year. Gardner dodged a direct question from Denver TV reporter about whether he’d support the Flake legislation. But Gardner was less certain about whether he’d support a bill to protect the investigation, which his outgoing colleague, Sen. Jeff Flake, R-Arizona, says he will try to pass before leaving office. Sen. Michael Bennet, a Colorado Democrat, was clear about his position [in favor of protecting Mueller] on Twitter. Gardner has repeatedly said he’s undecided before voting on controversial legislation. Most notably, he said he was undecided until the last minute on three variations of bills to kill Obamacare, before voting for each one of them. A move by Gardner to protect Mueller would be seen as hostile to Trump, who will likely be on the 2020 election ballot with Gardner. With Colorado split among Democrats, Republicans, and unaffiliated voters, Gardner can’t afford to turn off many GOP voters, who largely approve of Trump, and hope to win here. But if Gardner stands with Trump, he could earn the outright disgust of unaffiliated voters and suburban women, who are angry with the president. U.S. Rep. Mike Coffman and other Republicans in Colorado and nationally faced this political puzzle and lost on Tuesday. So far at least, it Gardner is more interested in leaning into Trump than running away from the president. “I’ll take him around the state along with other members of the delegation,” Gardner told St. George. On KOA radio today, Gardner said he thinks Trump should replace acting U.S. Attorney General Matt Whitaker, who Trump installed in place of fired Jeff Sessions. Gardner’s choices to replace Sessions are Weld County-area prosecutor George Brauchler, who just lost a bid for Colorado attorney general, or Colorado Springs Mayor John Suthers, according to his KOA interview. “Well, you know, I don’t think it was a blue wave,” said Gardner on air. “In fact, the tax increases were defeated. The anti-oil and gas the measure was defeated. You know, a couple of years ago we had all Republicans at the state level except for one seat the governor’s and nobody said we had a Republican red wave back then. So, I think Colorado once again is voting on balance and will continue to be a very bipartisan, diverse state. So, Colorado wants people who are going to work hard for each and every day, and I think that’s exactly the message we have to continue to send to people — that we’re going to do that. Gardner also said Republicans “defied history” on Election Day because “history would tell you that we should have lost the Senate majority on Tuesday night, but we did gain seats.” And he said Trump’s efforts were a “large part” of the senate victories. “It is going to be really catastrophic when you think about where we want the state to go,” said Buck on KNUS 710-AM’s Steffan Tubbs Wednesday. Denial is not just a river in Egypt, Cory. Cory undecided about upcoming controversial vote that would hurt Republicans. Gee I wonder how this one is going to turn out. I'm not certain if that makes Sen. Gardner more like Sgt. Schultz of Hogan's Heroes or Alfred E. Neumann of Mad Magazine. Given Cory's smile, I guess I've got to go with Alfred.